If you’re a cat owner, you know what that sounds means—your little four-legged cutie is off doing her business in her litter box! If you want to make it a little easier on yourself as far as clean up goes, then a self-sifting litter box could be exactly what you’ve been looking for. In this review, we’re going to cover the ins and outs of sifting litter boxes, including the pros and cons, things to consider, and which brands are the top picks to choose from. This way, you’ll be able to “sift out” the good from the bad before you buy. What is a Sifting Cat Litter Box? What Kind Of Litter Boxes Are There? A sifting cat litter box is a version of your animal’s “throne” that separates the soiled from the clean kitty litter granules. 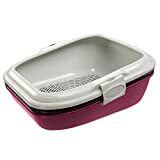 It generally works by having at few separate compartments: one sifting pan with small holes in it, and one or two trays with a solid surface. The clean litter granules fall through the small holes into one of the bottom trays, leaving behind the clumped waste in the sifting pan which you can easily discard. Depending on the size and type of litter you use, you’ll need to gently shake the pan to activate the sifting action (not unlike a frontiers man looking for gold in a sifting pan from a river!). The clean sifted litter from one bottom tray can then be poured back into the sifting pan after the pan has been stacked into the second empty tray. 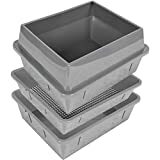 The additional tray can then be stacked beneath the fresh tray and pan for easy storage (this way, your cat always has a clean box on standby). The main advantage—indeed, sort of the whole point—of using a self-sifting litter box is that the soiled litter is easy to remove, and the clean litter is easy to separate and retain. Many cat owners who use sifting litter boxes also find that they can save some money on kitty litter, since the clean litter can be reused so easily and go a longer way. 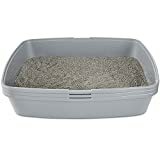 Sifting litter boxes are also great options for anyone who’s extra squeamish about having to scoop up litter, since these are designed to let a person get away with simply sifting and dumping a large tray rather than picking up waste with a little scooper shovel. Sifting litter boxes may also save you time, too—but this really all depends on the individual cat owner and her cat. Even when using a litter that’s labeled “dust-free,” the sheer action of sifting is bound to kick up some dust particles in the air. This is one of the major disadvantages of sifting litter boxes that you need to consider. If you have concerns about respiratory issues for yourself, a loved one, or your kitty, a sifting cat litter box may not be a feasible option. If you have many cats or a cat that expels a lot of waste, a sifting litter box could also end up costing you more time since you’d have to clean it more often and go through the steps over and over again. These boxes generally make the most sense for people who only have to clean their cats’ litter boxes every other day or a few days per week, rather than every day. That said, some reviewers of sifting litter boxes proudly report that they use them in multi-cat homes. Most sifting litter boxes come in large or extra large sizes. Obviously, you’ll need to make sure you get one that’s big enough to accommodate your large-sized cat or multiple kitties who may occasionally vie for space. Some cats are A-OK with an open tray style, while others prefer to do their business with more privacy. If your kitty is the latter, you should get her a litter box that has a hood so she’ll feel more protected. A hood, of course, just adds another piece of the box to manage and adjust when cleaning the tray, so keep that in mind. Beyond kitty comfort, another advantage of a hood is that it can cut down on dust and odor. No matter how many hacks you employ to make the litter box chore easier and faster, you STILL are going to have to clean and maintain your kitty’s throne on a regular basis. You’ll want to find a litter box that requires the least amount of upkeep on your end and avoids unpleasant issues like staining or waste sticking to the plastic. Self-clumping litter is generally the best type for sifting litter boxes—otherwise, urine can just fall through into the bottom tray, which totally defeats the purpose. But clumping litter generally isn’t recommended for cats under 3 or 4 months of age, and if your animal is super picky, you may have a hard time finding a litter she’ll like from your somewhat limited options. The litter you select also needs to be small enough in order to fall through the holes of the sifting pan, and hopefully as “dust-free” as possible to cut down on the dustiness during the sifting action. No matter what type of litter box you use, odor control is one of the biggest checkboxes you’re likely hoping to fill in. You’ll want to make sure the litter box adequately cuts down on odor (urine, ammonia, and feces), especially if it’s an open, un-hooded design. Of course, the type of litter you use and how often you clean the box will affect this, too. Just because your kitty litter box isn’t exactly going to be a key feature of your home decor doesn’t mean you can’t find something that will match your style! Like other types of litter boxes, self-sifting ones come in a variety of colors and styles. Choosing one that isn’t a huge eyesore for you should make the chore of cleaning it out a little less bothersome..even though your feline probably won’t really care whether you choose blue instead of red! This enclosed litter pan comes in large and extra large so it can accommodate even heftier animals. It also features a unique air filter to cut down on odor (which it already can do thanks to the hood). Customer reviews tend to comment on how efficient it is: with two collecting trays, your animal will never be without a box ready to go. Stay fresh with So Phresh! This self-sifting litter box features a simple, easy-to-use design. 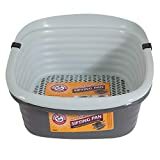 Users have found that adding liners to the bottom of the tray makes cleaning much easier (although this does introduce an added step and expense). This may be necessary for you because urine can often stick to the bottom of the collecting tray. But compared to other options, it’s much more affordable. 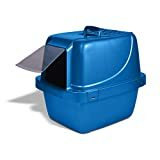 With a simple yet attractive design, this litter box is easy to clean and features higher walls to cut down on litter that gets kicked or tracked out of the box. Many users have commented that they literally do save money using it, since they can extend the length of time of the clean litter. It also can accommodate many different types of litter, so you won’t feel super restricted in the brand you have to use. Works as intended, as far as most owners are concerned! For an open litter tray that helps you sift out waste in a snap, this option may just be the right pick for your house. Even though it’s open at the top, the durable plastic design is large enough and high enough to prevent too much tracking. Just remember, your kitty may not like the non-hooded feature, so she may not want to use it if she’s used to going in a covered and contained space. This pan also comes with a specialized measurement system to ensure you use the right amount of litter and avoid wasting product. But some users find you end up having to use a little extra since the urine can clump up and use up a lot of it. This 4-piece self-sifting system from Hometec is pretty durable and versatile, since you can use it with multiple kinds of litter (traditional, clumping, gel silica, pine pellets, etc.). While some users find the holes in the sifting pan too large (and thus unable to separate out the waste from the clean litter), others feel that the product does work as intended. It could just depend on the type of litter you use and how large your cat is. Is this final selection your pet’s next best mate? Arm & Hammer’s large sifting litter pan features antimicrobial protection to reduce the risk of unpleasant odors and stains. Even though it’s uncovered, it has high walls to help your cat stay tidier and feel more secure while using it. Overall, it’s very effective at separating out the waste from the clean litter, so it really can save you on time and effort. This review focuses on just one kind of litter box: the self-sifting style. But there are several different styles you can choose from, and some may be better for you and your pet than others. Traditional litter pans simply keep the soiled and clean litter altogether. They may come with or without hoods, and like sifting pans also feature may different sizes. Traditional litter pans can accommodate virtually any type of litter, but just require that you look for and scoop out the waste with a scooper. Sifting litter boxes, as we’ve mentioned, can make clean up much easier since the waste will already be separated from the clean litter. The success of this box is really dependent on how well the litter you buy actually self-clumps—otherwise, it can be super frustrating to find little clumps of urine and waste mixed in with the supposedly “clean” litter below the sifting pan. Automatic litter boxes are the more technologically advanced option. These have motorized and electrical mechanisms that can dump your cat’s waste into a separate container (usually via some sort of conveyor belt contraption). You can then simply take the container and dump it out (and hopefully you won’t need to troubleshoot the contraption too often). Automatic litter boxes usually only work with certain types of litter—and certain types of felines, since the noise and movement may spook away some kitties…and you definitely don’t want to create a situation that discourages your animal from using her litter box! No matter how fancy or simple you decide to go with it, a litter box will be useless if your kitty doesn’t know how to use it! As with any litter box, sifting litter boxes come with a certain learning curve for most cats. You should be patient as your animal adjusts to her new box and be prepared to clean up unexpected accidents from time to time. Direct your cutie to the box when she’s likely to go. This is highly animal-dependent, but most kitties have the urge to relieve themselves right after they wake up from a nap, after they play, or after they eat. When you think it may be time for your kitty to urinate or defecate, bring her over to the litter box so she’ll start associating it with potty time. Supervise your kitten at first in and around the box and “show her” how to use it. You may not want to pick her up and place her inside it right away, but at least show her the entrance to the box and demonstrate the digging and sifting action (you may even be able to move her paws in the litter a bit so she gets the feel for it). If you have other older cats in the house, they may be able to pick up some of the slack here. The point is to create a positive environment around the litter box so she won’t be scared to go over to it. Play around it, give her treats near it, and remind her how much of a good girl she is any time she’s close by! A lot of kitty owners swear by self-sifting litter boxes. For the right households, these sifting boxes can save time and money, cut down on odor, and make clean up easier. If you’re considering getting a lift and sift litter box for yourself, it’s important to think about not only your personal approach to cleaning litter boxes, but how the litter box will be used in your household. Do you have multiple cats, or a large cat that goes often? If so, a self-lifting box may involve more steps than its worth. A home with one or more people with respiratory issues may also not appreciate the innate nature of the litter sifting action. But for the right situation (and right kitty), this type of box could be just the thing you’ve been looking for that makes this less-than-pleasant chore a little bit faster and better.